This contraption is a RIOT, and not so easy to do, to get going and keep going. AND MAN, WHAT AN ALL BODY WORK OUT! The best part is, you are having fun as you go! 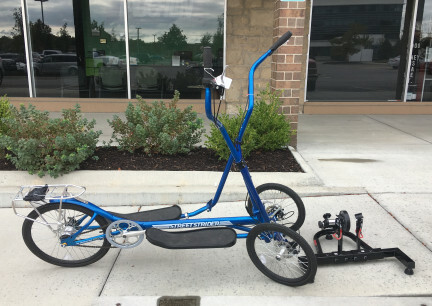 It is not as easy as you might think to get the StreetStrider going, and or to keep it going. To turn it, you lean. Believe it or not, it has three different gears and brakes. 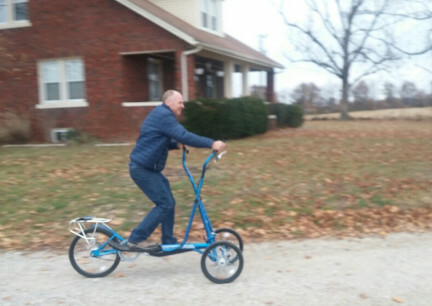 Deron can get, and could from the first time he got on it, the StreetStrider ROCKIN'! Man! As I said, It is a GREAT All Body Work Out! This was taken of Deron ROCKIN' the StreetSrider on Thanksgiving 2018. Our kids came out and we got it out to play! 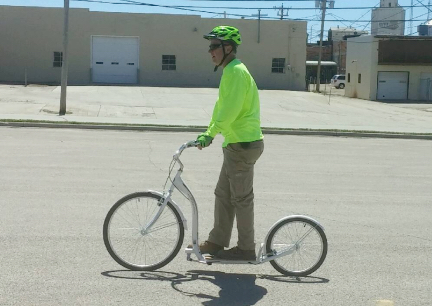 Deron riding our Schwinn Kick Scooter in Belle Fourche, SD 2017. We like this Schwinn Kick Bike so much, Deron bought me another Christmas 2018. Be sure to see our Dog Sleds page here to see us being pulled by our dogs in harness while we ride our scooters (and more). We also have other sites dedicated to our dogs. The contents of this page for Street Strider, Scooters and... is still under construction. Please check back later!